The volcanic island of Atlantis is blowing up and sinking all at once. Most of the residents have fled. However, some remain behind, looking to grab whatever they can before the apocalyptic end of it all. 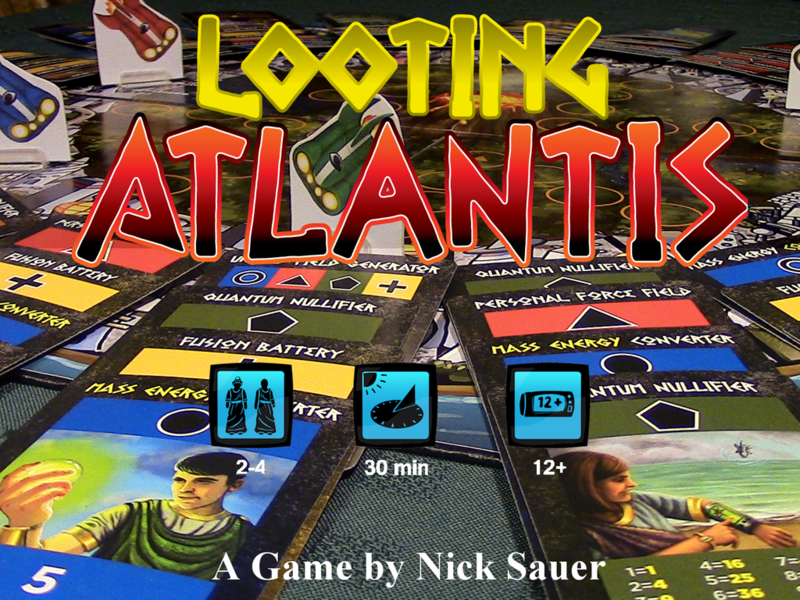 That is the story behind Looting Atlantis, a new board game by Shoot Again Games. It's up on Kickstarter now and looking for funding love. In the game, players are looters, flying around Atlantis in their hover cars (because Atlanteans had that sort of thing, of course), looking to loot whatever technology they can that's been abandoned as the others have left. However, the ever-encroaching lava is quickly destroying whatever hasn't been nabbed. So it's a race against the clock and against the other players to grab the best items before escaping to one of the neighboring kingdoms. However, each kingdom has different priorities on which types of technology they find most valuable, so you have to weigh the options of grabbing another piece of loot, but risk not getting to go to the neighboring kingdom you want (as each only has room for one more refugee). The campaign just got underway and is set to run for another 29 days.